The length of the Datsun GO is under 4 metres, so it is as long as the Honda Amaze and Maruti Suzuki Swift DZire. However, what this offers is extra flexibility with another row of seating or a humongous boot, when compared to the compact sedans and SUVs. As the ground clearance is the same, it drives like any other compact car and is easy to manoeuvre through tight city lanes with a turning radius of 4.6 metres. All that size of the Go translates to a spacious cabin. But of course you will have to overcome the cheapness you will feel as soon as you enter. Don’t get us wrong, the build quality and the way things are put together are on par with the segment but the Hyundai Eon feels Eons better, pun intended. Apart from that, things like the non-retractable rear seat belts, thin seats and uncovered glove box open up the question of how much cost-cutting went in the car.The interiors get a grey layout with a lighter shade of grey for the bottom of the dashboard. The over design of the dashboard is very simple and many things like the indicator stalks, AC vents etc are borrowed from Nissan Micra.A very simple instrument cluster comprises of a very large speedometer (no tachometer) and a MID. The MID offers a wide range of information like tachometer, odometer, tripmeter, distance to empty and average fuel economy. Though simple, the steering wheel is of nice size and feels light. The horn pad is big but the horn itself is a poor sounding single unit. The gear lever and the handbrake find their place on the dashboard instead of the conventional in-between the seats one. Though the gear lever is ergonomic once you get used to it, many will not like the placement of the gear lever and the old style pull and twist handbrake.The centre console gets two AC vents, an unusual audio setup and HVAC controls below. The switches and knobs are of good size and quality. The glove box is deep but comes without a closing lid. The same thing happened with the Nissan Evalia, which later got one, but the Go comes open only. Other storage spaces include smaller cubby holes under the steering wheel (none of them are closed) and bottle holders on the front doors. Coming to the seat setup, the Datsun gets a connected seat, which is almost bench type seats you get in old HM Ambassadors. You can’t seat another person as there is neither the space nor any seatbelt. Datsun has said that this space can be used for storage space which sort of defeats the purpose of having a ‘seat’ and not usable cubby holes.Though the seats are thin, they offer good support. Having the longest wheelbase in its segment (longer than some in a segment above too), the Go offers excellent space, especially in the rear. Three adults can travel in reasonable comfort in the rear, when compared to the constricted space of the competition. Powering the Datsun GO is the de-tuned 1.2-litre, 3-pot motor from the petrol Micra which outputs 68 PS of power at 5000 RPM (the same engine in the Micra makes 76 PS at 6000 RPM) and 104 Nm of torque at 4000 RPM. This engine is relatively smooth for a 3-cylinder mill and the light weight helps it gather good pace quickly. Mid-range is strong and the engine keeps charging, losing steam sharply in the top-end as the rev-limiter cuts in too early at just 5200 RPM. Near the rev limit, the motor is filled with vibrations, buzzing in despair but in spite of the 3-pot configuration, the motor has good NVH throughout the power band with on idle vibes being the major achilles heel. The vibrations are more when the AC is switched off as the engine RPM reduces. Safety is one of the main priorities of many Indian consumers especially when they are choosing a car for their entire family. 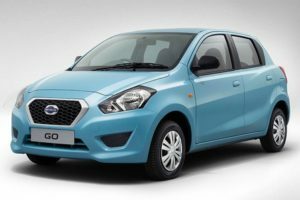 For your information the Datsun GO will disappoint you once again here because quite frankly it lacks lot of safety features which you would normally expect out of your family hatch.The Go does not have any provision of a airbag in any of its variants. Although it has been provided with disc brakes at the front but there is no ABS option either in the car. So if you are concerned about all these safety measures then we are afraid that Datsun GO won’t provide you with any. One has to admit that the Datsun GO has to face tough competition from its peers. However, it has managed to carve out a niche for itself in the Tier 2 and Tier 3 cities in India. The unavailability of the Datsun GO diesel variant can prove a disadvantage. However, the Datsun GO petrol models have the ability to hold their heads high amidst heavy competition. In fact the tuning done on the engine of the Datsun GO is so much better than the Nissan Micra that you really don’t put the 3-cylinder motor in inferior hardware category. In spite of the modest horse power, the GO is quite fast with 0-100 km/hr coming up in 14 seconds, aided by its light weight and good power to weight ratio. Not only can you potter around town in higher gears with comfort, you can also cruise on the highways without the engine feeling uneasy. The 5-speed gearbox has decent shift quality although it feels a bit notchy but the clutch is light. The ARAI claimed mileage for the Datsun GO is 20.6 km/l which is better than the Micra even though it is equipped with the same motor. Expect real world mileage to be around 15 km/l, making the Datsun GO quite frugal. This entry was posted in Auto and tagged Datsun by admin. Bookmark the permalink.